Candidates can apply from the link provided below. The admission in the institute will only be granted on the basis of merit. Check more details on FDDI AIST 2019 from this page. 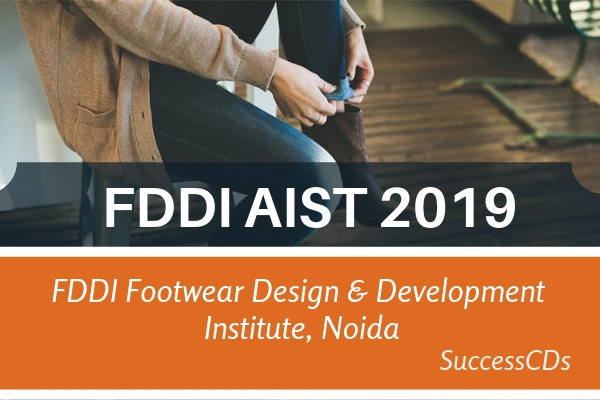 Footwear Design and Development Institute (FDDI) conducts All India Selection Test (AIST) to offer admission to interested candidates in professional program in Footwear, Retail, Design and Leather Accessory Design. M.Des- CAD: Candidate is required to be a Graduate in Footwear / LGAD / Design / Engineering / Production/Technology/Fine arts or any other related program. M.B.A (Retail & Fashion Merchandise): Graduate in any discipline. Candidates appearing in final year may also apply for all Master Degree program. Candidates should have cleared class 12 the examination from a recognized board or university. Candidates appearing in 10+2 may also apply. Eligible candidates will have to undergo an All India Selection Test (AIST) that consists of online test (Math, English, reasoning/General Science & GK). Candidates who have attempted CAT/MAT/XAT are eligible for exemption from appearing in the online test of FDDI. Candidates appearing for CAT/MAT/XAT will also have the option to appear for FDDI online test. In that case, the better of two exams i.e. CAT/MAT/XAT or FDDI written exam will be considered for the merit of selection. The common merit list of online test will be prepared for candidates appeared in test of FDDI and applied under CAT & MAT category. FDDI entrance exam eligibility criteria states that aspirants who are 25 years of age or below as on 25 Years as on 25th June 2019 can appear for FDDI AIST 2019 for UG admissions. However, there is no age restriction for aspirants applying for PG course admissions. AIST 2019 is conducted both in the Hindi as well as English medium. This design entrance test will be conducted only as a computer based exam. FDDI entrance test will be 2.5 hrs (two and half-hours) duration and would be conducted in English and Hindi languages. There would be a total of 200 objective type questions. Section D - Management Aptitude for Management Program for MBA-RFM or Design Aptitude Test (DAT) for Design Program M.Des-FDP & M.Des-CAD 50 questions. As per the last year, FDDI AIST had to be conducted at following centre: Agra, Allahabad, Ankleshwar, Bangalore, Bareilly, Bhubaneswar, Chandigarh, Chennai, Chhindwara, Chittorgarh, Dehradun, Delhi, , Ghaziabad, Gorakhpur , Guna, Guwahati, Gwalior, Hyderabad, Indore, Jabalpur, Jaipur, Jalandhar, Jammu, Jamshedpur, Jodhpur, Kanpur, Kolkata, Lucknow, Meerut, Mumbai, Noida, Patna, Ranchi, Raibareilly, Rohtak, Kochi, Shimla, Visakhapatnam. Aspirants need to mention the names of four test city choices in their FDDI application form (in order of their preference) for examination centre. Application Form will be Available Online on Website at www.fddiindia.com. Candidates are required to fill Registration Form Online as per the instructions mentioned and upload the requisite documents at the time of Registration.A candidate can apply for more than one program by paying for a single registration form. For applying in multiple program candidate has to fill the program code in accordance to their preference of program as mentioned in the Registration Form. If a candidate wishes to apply for both BACHELOR & MASTER’S DEGREE Program, he / she has to fill two separate Online Registration Forms. Candidate can select the centre and date of his / her choice from the dates given on the Registration Form for appearing in AIST. Maximum efforts shall be made to accommodate the request on first come first serve basis. However, due to infrastructure constraints a candidate may sometimes be asked to appear on another date / centre. Candidates applying under the “Reserved Category” (SC/ST/OBC/PH/Disabled) must upload a self- attested documentary proof, as admissible. Candidates applying under exemption for written exam must upload scanned copy of his / her relevant scorecard or admit card (in case result is awaited) of the exam in which he/she has appeared. Payments of application fee (Rs.500/-) can be made through credit cards/debit cards. The bank and/or transaction charges on the application fee will be borne by the candidate. Candidates are advised to apply on or before 20th April 2019. Candidate facing technical problems while filling in the Registration Form may call 0120-4818400(Weekdays between 10:00 am to 5:00 pm) except on Government holidays. On the basis of information given in the FDDI Application Form, Admit Card of provisionally eligible candidates will be available for download from Website https://applyadmission.net/fddi2019 from 01st May 2019 (1300 hrs) onwards. To download Admit Card candidates need to login to the website: https://applyadmission.net/fddi2019. A link for downloading Admit Card for written test, containing the details of the centre/venue for the exam, etc., will be available.